This month I’m wearing a different hat. 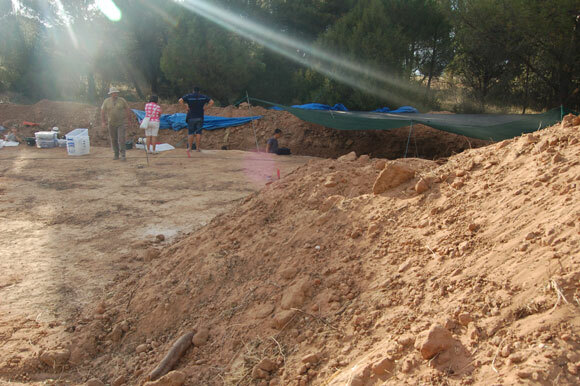 I’m helping English-speaking archaeology students get fieldwork experience at an excavation of an abandoned Roman city about 160 kilometers north of Madrid called Clunia. 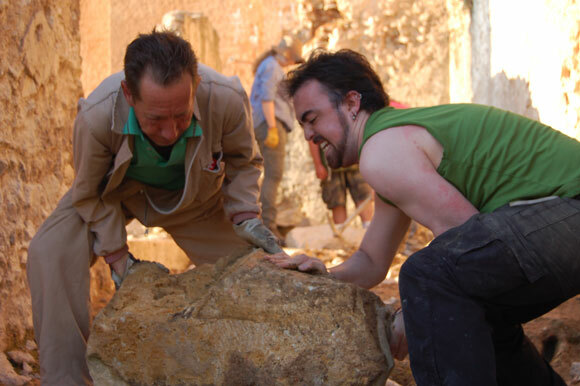 A Spanish archaeology team is trying to wrap up the remaining corner of a large theatre after about a decade of work there. Actually, I don’t normally wear a hat at all, but for this dig I’m pressing into service a straw hat I bought 6 years ago for a climbing trip to California’s Sierra Nevada. It’s not Indy’s fedora, but so far it’s fending off the Spanish sun. Thanks to one of the students, Indigo, for this photo. 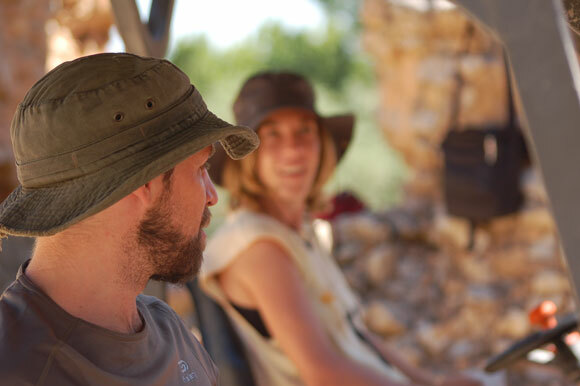 My friend Mike, a journalist most of the year, has been coordinating ArchaeoSpain, which brings in foreign archaeological students, for the last few years. 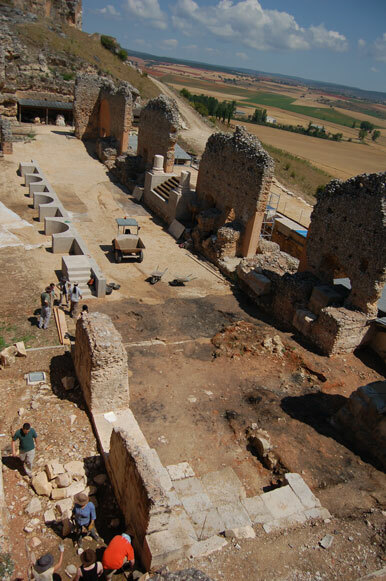 Before that he’d dug during summers here and at Tiermes, another Roman city in the neighboring province of Soria. He’ll pop in and out of this and some other ArchaeoSpain sites this month. 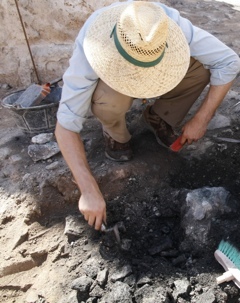 His assistant here at Clunia, Aixa, has worked at Tiermes, Clunia, and at a dig in Egypt. I’ll be helping her wrangle the nine students here this month. The theatre shows some signs of the city’s rise to regional prominence, decline, looting and abandonment. We’re working on an ash layer right now and some walls that were probably built within the shell of the original theatre a century or two after it was built. 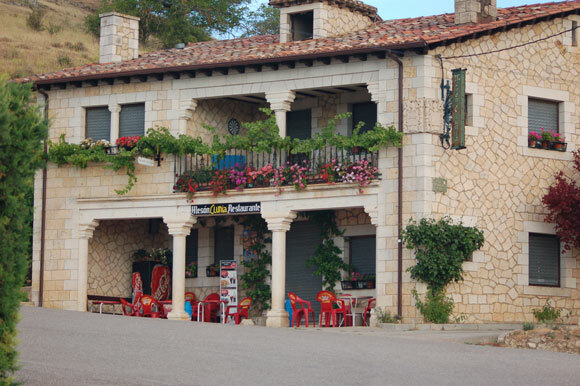 We’re staying in the modern-day hamlet of Peñalba de Castro, perched on the shoulder of old Clunia. Clunia is on high ground–the Romans favored aquifers over river water–so we have energizing views of the neighboring wheat fields. I especially like the fallow ones, which glow bright red thanks to the region’s iron soil. Mike rents a pair of apartments from Vicente and Consuelo, a couple who also operate the Meson Clu nia, where we take our lunch and dinner most days. I share one apartment with four of the ArchaeoSpain students. They hail from Ireland, Australia, and the US, though both Americans are studying in Scotland. Aixa is staying in the other apartment in the same building with five more students from Australia, the US, and Scotland. We meet every morning at a compound across from the mesón, which contains a warehouse for artifacts and a house for the Spanish archaeologists working on the site. 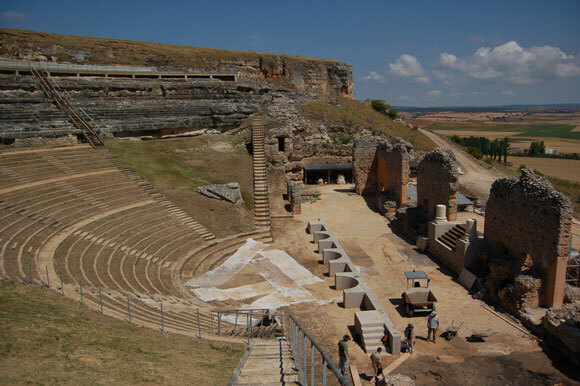 Then we stroll over to the theatre, about 100 meters away, and divide into small groups to work on sections of the site. The Spanish archaeologists decide what they want us to work on, and Aixa and I translate and explain to the ArchaeoSpain students. We also pitch in wherever we’re most useful. Most days we work from about 7:30 to about 14:30, take a long lunch, and then shower and nap and spend time o n the internet in the afternoon. Dinners are at 21ish. 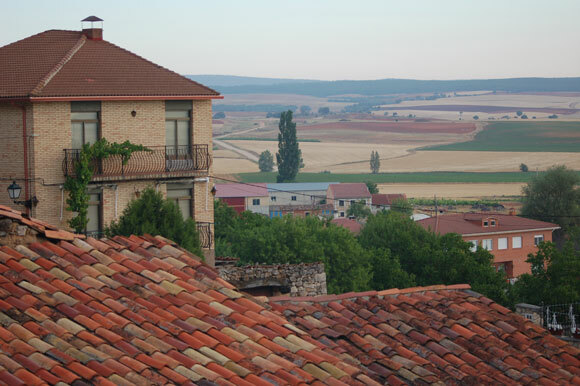 But Thursday last week we went for an afternoon excursion to another site near Aranda de Duero. The site, which another team of archaeologists opened just Monday, contains 50 or 60 skeletons. The remains are from victims of executions during the Spanish Civil War. Local anthropologists had a secondhand tip from a shepherd about the mass grave, which turned out to be much bigger than they expected. One of the archaeologists told us the grave appeared to have been used six times, with room left for more burials. The skeletons were mostly intact. Some had unique features, such as a glass eye, or a train service vest, which anthropologists hope to use to identify them. A rosary rested on the right hand of one victim. Rubber soles remained attached to most of the bodies’ feet. They will also take the bones to the lab for DNA analysis. As we walked in, anthropologists were recording interviews with locals who either were around in 1936 when the first part of the grave was probably dug, or heard stories from neighbors and family who were. One man was close to tears. 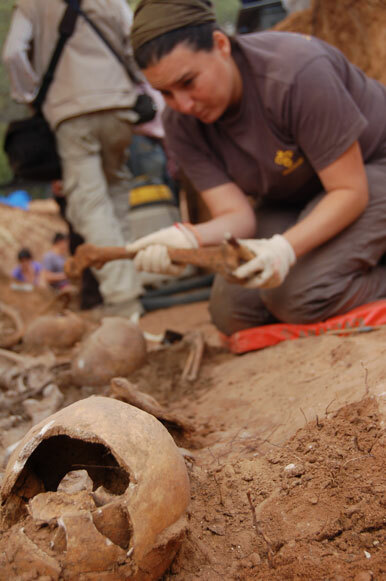 Mass graves are a touchy subject in Spain right now. Victims of the Spanish Republic were quickly disinterred under Franco’s regime and reburied in normal graves with memorials. Victims of Franco were left undocumented and underground until about ten years ago, when the first serious efforts to find them began. Now the government is funding some of the work, but not everybody is happy with it. Mike was at another site, which he reported on for Archaeology, and a passing driver shouted to leave the bodies at rest. Of course, family of Franco’s victims might ask why their family are lost in mass graves while victims of the Republic are in hero’s graves. Two different kind of archeology, isn’t it? Definitely. Have you taken any tour groups to see Spanish Civil War sites? 15 already since I started this tour 6 years ago. Surprisingly mostly Americans and British (and some Canadians).